There is a wide variety of life in Fiji’s waters, including dolphins, sea turtles, many sharks, sea snakes, corals and a colourful array of exotic fish to name a few. 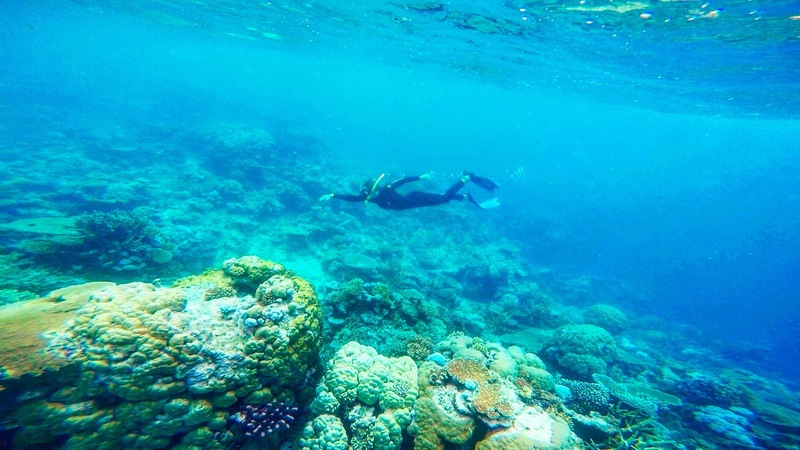 Activities, including snorkelling and diving, also enable people to explore Fiji’s magnificent underwater world. The Somosomo Strait which runs between Taveuni Island and Vanua Levu is one of Fiji’s best known dive destinations. 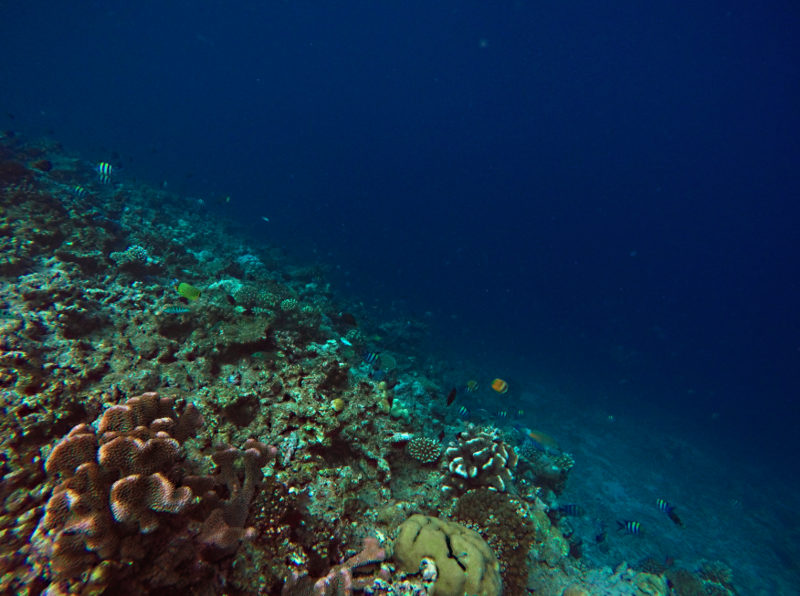 The strait almost single-handedly earns Fiji its title as the “Soft Coral Capital of the World”. I was lucky enough to visit this spot in my first month at Island Spirit, on a work trip to Taveuni. You can read more about this adventure here. Many divers come to Taveuni just to witness the excellent soft coral blooms that occur when the current is running just right. The tidal current and constant year–round water temperature of the Somosomo Strait create an ideal environment for hard and soft corals and marine creatures such as reef fish, turtles, eels and anemones with their brilliant pairs of clown fish. We work directly with Taveuni Ocean Sports, they were extremely helpful and fun to spend the morning out on a boat trip with. The snorkel trip included a light lunch break with yummy dips, cakes and fresh fruit. The Mamanucas Islands is a volcanic archipelago off the West coast of Fiji’s mainland – Vitu Levu.Snorkelling at Mana Island is excellent. I joined a dive and snorkel trip on my weekend away to Mana in the Mamanuca Islands back in March. I visited the infamous “Supermarket” dive site with the chance to dive with White Tip, Black Tip and Grey Reef Sharks plus thousands of colourful tropical reef fish. 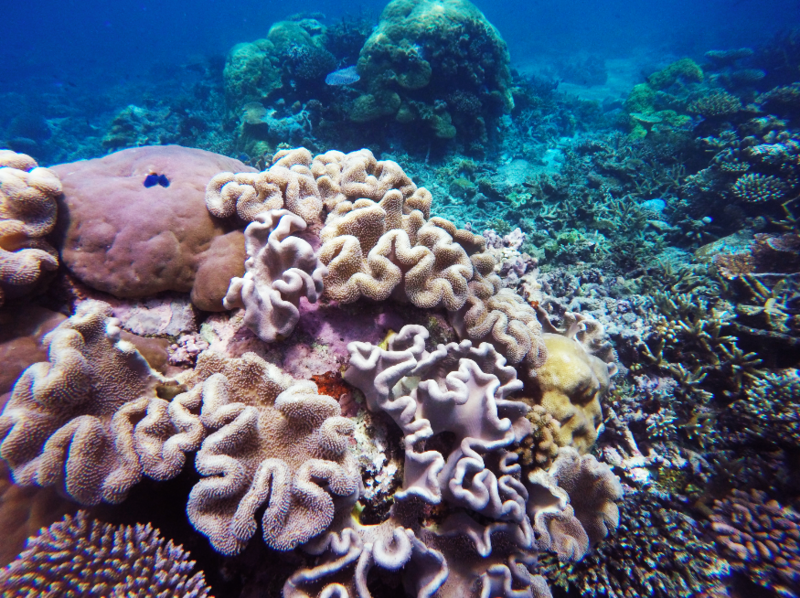 The corals here are in a superb condition and present a great opportunity to explore local marine life of Fiji. It was amazing to be swimming next to these majestic creatures in the deep blue sea! If you are looking to visit the Mamanucas in your time in Fiji. Island Spirit will be happy to help you find eco lodges and family run accommodation for your stay. You can view a selection of our Fiji eco escapes here. Further north of the Mamanuca Island’s is Fiji’s YASAWA Islands where Manta Rays are commonly spotted. Stunning coral gardens, spectacular swim throughs, amazing reef walls and over a thousand species of marine life are just some of the things you’re likely to experience in the Yasawa’s. Between the months of May to October you can experience the Manta Ray close up as they glide majestically through the waters around Mantaray island Resort. Fascinated by the swimmers, manta ray will frequently perform graceful aquabatic displays. Magical somersaults and loop the loops. The Coral Coast is a 50 mile stretch of beaches and bays along the Queen’s Highway between Nadi and Suva on Fiji’s main island, Viti Levu. The Coral Coast, where we were working for our May and June 2017 Coral Gardening trips, is (as the name suggests) the largest fringing reef in Fiji. Many of my weekends off from work were spent on the coral coast. My favourite spot is the Fiji Beachouse. This is a family owned resort located on a sheltered sandy lagoon and surrounded by acres of lush gardens. The water is crystal clear here and the reef abundant in marine life. This locally run lodge has THE friendliest of staff who really made my time here special. Many of our eco tours in Fiji will at some point stop off, or begin here – it really is special, you’ll have to see for yourself! The Beachouse fosters a more authentic Fijian experience than offered by the larger resorts. 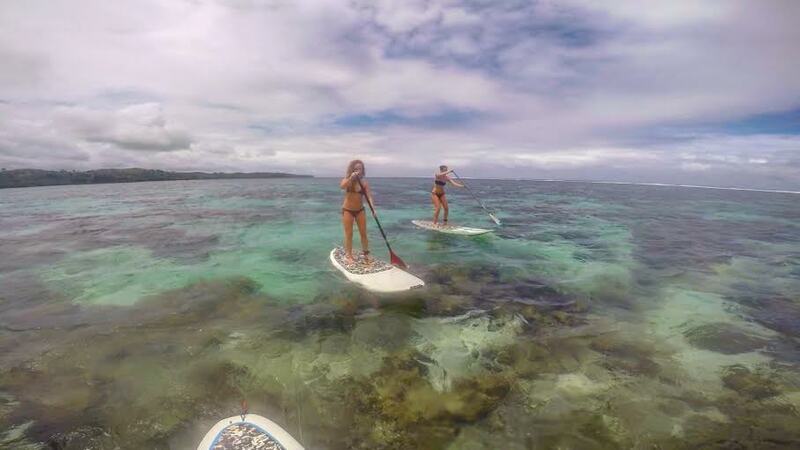 The coral here is also fantastic, and the crystal clear waters make it the perfect place to hire a Stand Up Paddle board and glide over for a peak! 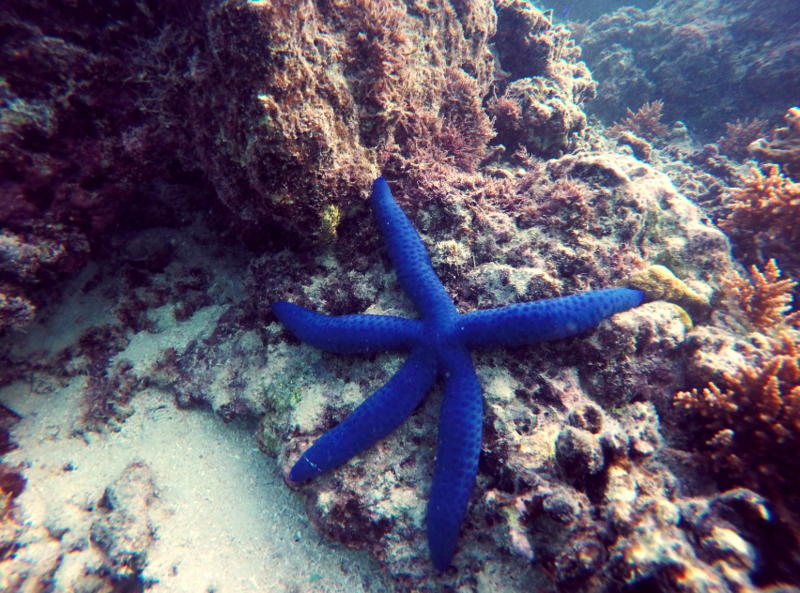 It always amazes me to see the sea floor here dotted with these electric blue unique star fish. 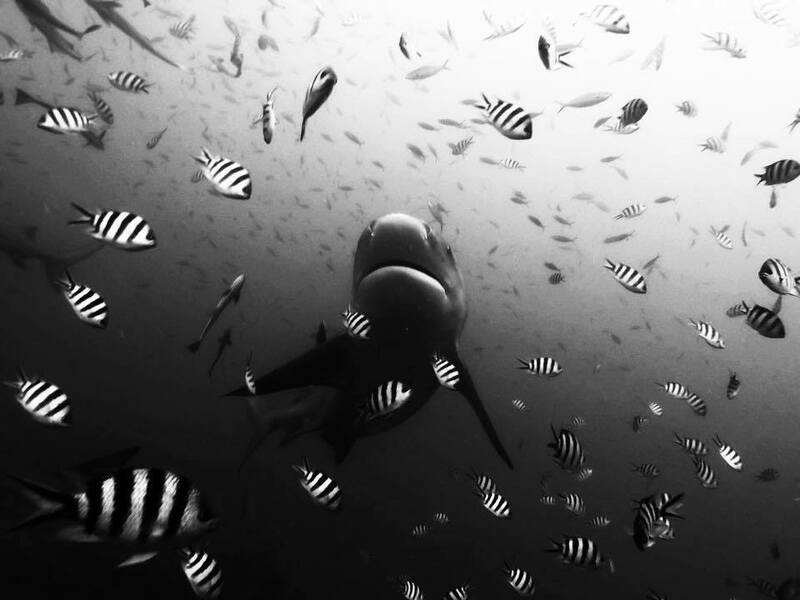 Dive with Bull Sharks at Beqa Lagoon!! Apparently, this dive is a MUST, and I really recommend you get your PADI qualification and come here (you can’t dive without one!). Here is a photo taken by my lovely new friend, Malin, who I met in Fiji. 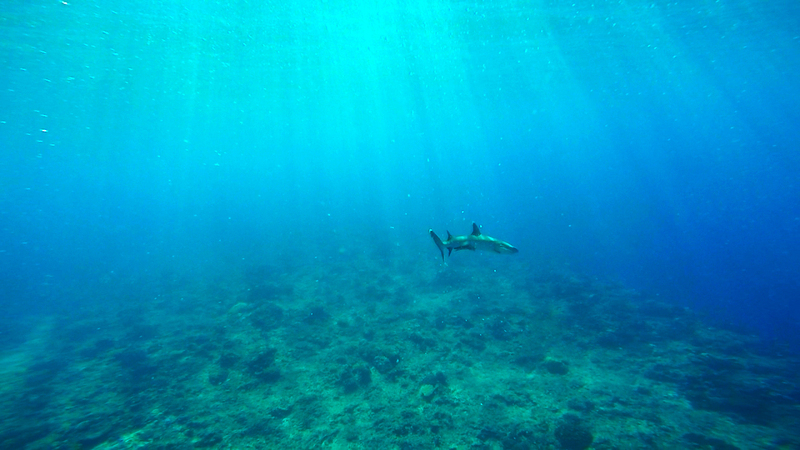 Click here to browse our Fiji eco tours and join us in the tropical waters soon!